As soon as the Phase I of the Large Woody Debris project was complete CRSA started working on a Phase II project. Almost immediately CRSA received a donation of 21 redwood rootballs and donation of transportation for those rootballs from Santa Rosa to Carmel. CRSA also secured a number of granite boulders for anchors. The next step was obtaining a grant to install the structures in the upper part of the main lagoon (lowest section of the river). After three failed attempts CRSA obtained a $360,000.00 grant from the California State Coastal Conservancy. These were funds transferred from a settlement agreement between Cal Am and National Marine Fisheries Service and dedicated to helping steelhead on the Carmel River. Part of the $360,000.00 grant was matching funds of $23,000.00 from CRSA. With California State Parks as the willing property owner, CRSA organized a team to complete this work: Central Coast Salmon Enhancement to provide permitting and administrative duties, Stillwater Science to provide engineering, California Conservation Corps to do the actual construction, Siller Helicopters to air-lift the structures from the construction area to the river, and MEarth to revegetate the construction area when everything is complete. 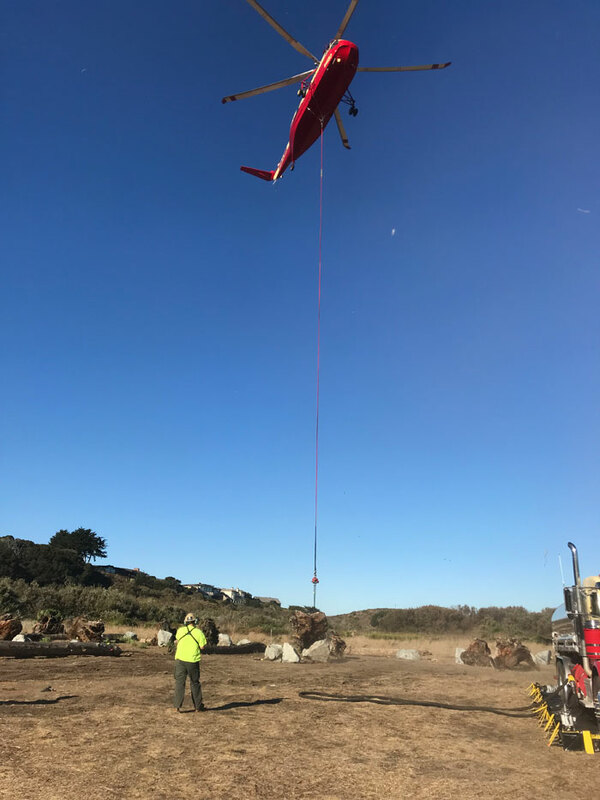 At 9:46 on October 25, 2017 a helicopter from Siller Helicopters lifted a redwood rootwad attached to a 3/4-ton granite boulder. This was the first of 48 lifts needed to place the long-awaited CRSA Large Woody Debris Structures into the Carmel River. Two years and 38 days after receiving a $360,000.00 grant from the California State Coastal Conservancy and after a decade of planning, the Carmel River is a better place for steelhead and all other creatures that utilize a riparian habitat. With California State Parks as a willing landowner and partner, CRSA formed a dynamic team to accomplish something we believe has never been done before; lifting large woody debris structures one piece at a time and assembling those pieces under water. Stillwater Ecosystems, Watershed & Riverine Sciences engineered the project and followed through until the pieces were chained together in the lowest part of the Carmel River. A river which, because of delays due to the helicopter we needed still on wildland fires and then high tides overtopping the sandbar, actually became part of the Carmel Lagoon at an average of eight feet deep. Until one goes through the entire process required accomplishing a project like this it is hard to think of all the pieces that need to fit together. Fortunately, CRSA understood somewhat what was necessary and contracted with Central Coast Salmon Enhancement to administer the grant and secure all necessary permits from six different agencies. A shout-out must go to the California Conservation Corps who provided the workers to drill into each boulder and epoxy a piece of threaded rebar with an eyebolt in place, then drill completely through each rootwad and log, and then place a piece of 7/8-inch threaded rebar through the rootwads and logs and then epoxy a heavy washer and eyebolt to each end. After all of that they had to custom cut half-inch alloy chains and attach those chains to each piece so the helicopter’s electric hook could be attached. To complete a project like this took a long list of contractors, at least eight different material suppliers and close to one hundred different people. Contractors that participated (in no particular order) were: Cordrey Construction (land based equipment), Dawn Reis Ecological Studies (red-legged frog training and nesting bird surveys), MEarth (revegetation) Monterey Bay Diving (connecting parts together under water), and Glen McDowell Photography (videographer). There were other companies, individuals and agencies that donated time, equipment or, in the case of the Carmel Area Waste Water District, water for cleaning equipment and dust control. After all of the planning, delays and worrying there was a picture perfect day for installation with great blue skies, no wind and ideal temperatures. It was around 3:30 when the helicopter started the last, most complex structure by setting down a 30-foot gray pine log with a half-ton boulder attached and then moving the helicopter to direct the log to lay in the correct direction. We had budgeted 5 hours flight time for the helicopter and only used 4.5 hours, a testament to weeks of planning work and the skill of the helicopter pilot. While the helicopter only worked 4.5 hours transporting the pieces, it took Monterey Bay Diving with engineering and other help two days to chain pieces together. A job that was made very difficult because the lagoon overtopped a week earlier raising the depth of the lagoon two feet and reducing visibility to less than eighteen inches. Once it rains and that part of the lagoon becomes a river again we will have to go back and see what we ended up with. We anticipate we will need to tighten all connections, but for now all parts are connected and will not float away. So to everyone who has helped and all of you who have followed this saga – a job well done! In studying the history of Large Woody Debris Structures I found an article where the author stated there has never been a river where too much wood has caused a decrease in fish numbers. With that thought and a couple of weeks to regroup, it is time to start thinking about the next project. It is time to start thinking about LWD Phase III.